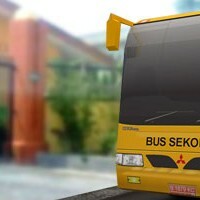 Based on Transjakarta bus design, Rino Liha from Bekasi - Indonesia made custom modification on its texture to become Mayasari Bakti bus. Mayasari Bakti is one of mass transit alternatives in Jakarta, they operate outside Transjakarta Bus Way corridor and also serve as feeder transports. Many of their buses are already old, some 30 years old buses still operate and its black smoke trail even got ticker day by day. They surely need replacements. 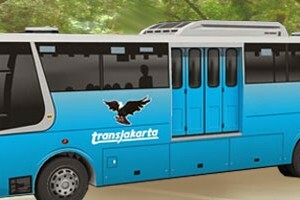 Blue version of Transjakarta bus, this CNG (Compressed Natural Gas) fueled bus served on Corridor II, Pulogadung bus terminal to Pasar Baru Jakarta, Indonesia. 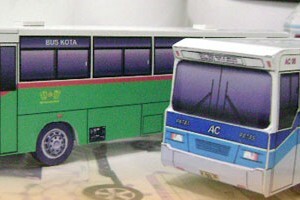 There are total 7 corridors of mass transit bus in Jakarta. TransJakarta started on January 15, 2004 and currently has 7 corridors (or lines) with 32 new corridors under construction. TransJakarta was designed to provide the citizens of Jakarta a fast public transportation system to help reduce rush hour traffic. The Indonesian Government provided TransJakarta buses with their own private lanes and Transjakarta's ticket prices are subsidized by the state government.